Sunday night it was the Superbowl and as usual I spent most of yesterday walking around like a zombie from just a few hours of sleep. 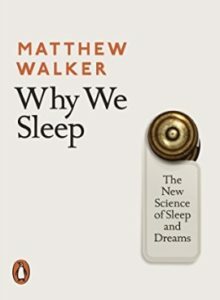 The issue of tiredness and sleep links into one of my fave books of last year which was “Why We Sleep” by Mathew Walker. Willpower / Goal Focus – The more tired you are the weaker your willpower becomes and the less important your goal is to you. This means that you will cave in more easily to foods you shouldn’t and much less likely to do the tasks needed to change your body. What is worse than not doing the needed behaviours is that you are less likely to even care about them or your goal. Energy – Sleep deprived nights drain your energy which means the chances of you exercising are greatly diminished. Compounding this problem is that when you are low on energy the odds of grabbing for high calorie foods are greatly increased. Emotional Stability – Good quality sleep allows the mind and body to process and mediate your emotional health and stability. This links into feeling stressed which has a direct correlation with bad eating. The less you sleep, the more stressed or unhappy you will feel and the more comfort food you will eat. Productivity – As your sleep quality and duration decreases you get less things done, this means more time wasted. As a result you will spend more time in work, more time doing household chores and so forth. This means there is less time for looking after your body and doing the tasks to get in shape. Hormonal Health – The physical benefits to our health cannot be underestimated neither as sleep is hugely important in regulation of your hormonal system. This has direct influences on people looking to develop muscle size and tone. It also underpins almost all health issues to some degree. So What Can We Do About Getting More Sleep? – Ensure the room is dark, electronic gadget free and on the cooler side. – Track how many sleep opportunity hours you give yourself per night. That is, how long you were in bed, lights and phone off etc in which you could potentially sleep. You should be aiming for 8 hours per night. One of the main tenants of the book is that minor sleep deficits e.g. 6.5 – 7 hours sleep per night over 8 hours have very significant impacts on the body. I started measuring my sleep opportunity hours since December and found it amazing how sleep hours correlates with work productivity and mental focus. My energy levels physically do not seems to be that different on 6.5 hours vs 8 hours but my mental speed, (reading speed, writing speed, likeliness to check my phone) are in a different world. It feels like I can read at twice the speed. How Many Sleep opportunity Hours Do You Give Yourself? How Does it Affect Different Elements Outlined Above? Photo – Why We Sleep Book – Mathew Walker.